On September 30, 2018, the United States, Canada, and Mexico reached a new free-trade agreement that is expected to replace the North American Free Trade Agreement (“NAFTA”) in early 2019. At a high level, the United States-Mexico-Canada Trade Agreement (“USMCA”) requires only Canada and Mexico to make serious legislative changes with regard to intellectual property protection. Most notably, these changes include extending the copyright protection term, mandating a notice and takedown system to combat copyright infringement, implementing pre-established remedies to combat trade in counterfeit and pirated goods, introducing a patent term adjustment procedure to compensate for Patent Office delays, broadening protection and enforcement of trade secrets, and increasing the data protection term for biologic drugs. From our reading of the intellectual property sections of the USMCA, we did not see any requirement for the United States to make any changes to its law on these issues. Each country’s leader has signed the new treaty, but it still must be ratified by all three governments. The agreement covers a broad range of topics, including a fairly substantial chapter dedicated to the protection, enforcement, and innovation of intellectual property. The USMCA’s IP provisions largely apply existing U.S. IP laws and standards to Canada and Mexico. In fact, most of the USMCA’s data and IP provisions were copied from the Trans-Pacific Partnership (“TPP”) agreement (of which the U.S. declined to be a member), in which these provisions were key U.S. demands. The result is an agreement that requires Canada and Mexico to implement significant changes to their IP laws to conform with U.S. standards. 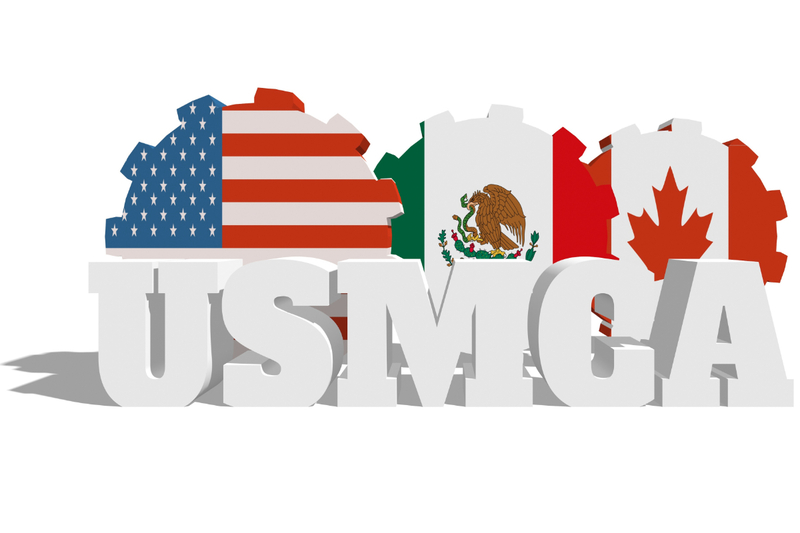 This article highlights the key changes these three countries must make in order to comply with the USMCA. The USMCA most closely reflects U.S. IP laws, subjecting the U.S. to almost no revisions of its current domestic intellectual property laws. On the trademark front, the USMCA requires a system for pre-established damages to be implemented in order to better handle trademark counterfeiting, which remains a problem in Canada. Even though Canada made significant changes to its laws with the 2013 Combating Counterfeit Products Act, the legislation has widely been viewed as having serious shortcomings that have failed to make Canada effective at combating counterfeits. Specifically, the USMCA calls for pre-established damages in civil proceedings with respect to trademark counterfeiting “in an amount sufficient to constitute a deterrent to future infringements and to compensate fully the right holder for the harm caused by the infringement.” Although Canada’s Copyright Act provides pre-established statutory damages, its Trade-marks Act does not. In addition to the pre-established damages as a tool to combat counterfeits, the USMCA also requires Canada to grant its customs authorities the ability to initiate border measures ex officio (i.e., “by virtue of its position”) against suspected counterfeit trademarked goods or pirated copyrighted goods under customs control (i.e., goods that are imported, ready for export, in-transit, or admitted into or exiting a free-trade zone or bonded warehouse). This provision will require Canada to amend its legislation and remove the exception to the detainment of counterfeit goods that are only in transit through Canada to other destinations (see Canadian Trademarks Act Section 51.03(2)(d)). Currently, unless dealing with goods that are of national security or public health concern—the latter of which is given a very narrow interpretation—Canadian customs officials will generally only detain counterfeit goods if a brand owner has filed a Request for Assistance (“RFA”) and the goods are later intercepted by border security. However, Canada’s current Trade-marks Act already gives customs officials the power to detain counterfeit goods ex officio, so it is possible that Canada already complies with these USMCA provisions. Also under the USMCA, “competent authorities” must also be granted the right to destroy “suspected counterfeit trademark goods or pirated copyright goods” following a determination that the goods are infringing. Like with the aforementioned provision concerning the detention of counterfeit goods, Canada arguably may already comply, since its current laws allow for destruction of goods following a judicial determination of infringement, which could be found to satisfy the “competent authority” definition. Alleged initial discussions with Canadian governmental officials on each of these issues tends to support their position that Canada already complies with these provisions of the USMCA, and that, other than removing the “in transit” language, no further legislative changes in these areas are required. The USMCA includes explicit provisions mandating that, under appropriate circumstances, collective marks and certification marks be registrable as trademarks. Canada allows registration for certification marks, but Canada will likely need to implement legislation to permit the registration of collective marks. The USMCA restricts registrability of geographical indicators (“GIs”) and also provides grounds for denial, opposition, and cancellation of such marks. This effectively makes it more difficult for parties to register GIs that are common food names, and common name users will be able to oppose GI applications that would monopolize use of generic terms. Canada will likely need to adopt parameters for determining whether a GI is generic as well as procedures for opposing, denying, and cancelling such registrations. The USMCA has been touted as having the most robust protection for trade secrets of any prior trade agreement. It includes all of the following protections against misappropriation of trade secrets, including by state-owned enterprises: Civil procedures and remedies, criminal procedures and penalties, prohibitions against impeding licensing of trade secrets, judicial procedures to prevent disclosure of trade secrets during the litigation process, and penalties for government officials for the unauthorized disclosure of trade secrets. It also mandates that a party cannot limit the term of protection for trade secrets. Canada currently relies on a mix of national security legislation, the civil code, common law, and contractual protections to protect trade secrets. Canada may be required to develop or update its legislation on the misappropriation of trade secrets, but some scholars argue that the provinces already provide the trade secret protection called for by the USMCA. The USMCA requires the Parties to provide data protection, also known as market exclusivity, for at least ten years from the date of first marketing approval for new biologic drugs. Presently in Canada, “innovative drugs” that contain a medicinal ingredient are only entitled to eight years of data protection, subject to six-month extensions. Upon ratification of the USMCA, Canada has five years to extend its current term to the mandated ten-year term. The USMCA contains a provision on patent term adjustment to compensate an applicant for an unreasonable delay in the issuance of a patent. An unreasonable delay would include the issuance of a patent more than five years from the date of filing of the application in Canada, or three years after a request for examination of the application has been made, whichever is later. Practically, this change will benefit patentees forced to wait longer for patent issuance but may also make determination of a patent’s expiry date more difficult. Canada will have 4.5 years to implement this rule, and it will only apply to applications filed on or after the date of entry into force, or two years after the signing of the USMCA, whichever is later. The USMCA calls for the copyright term to be the life of the author plus 70 years—a 20-year increase from Canada’s current law that releases copyrighted material into the public domain after life of the author plus 50 years. Canada has 2.5 years to implement this change. Although the USMCA calls for a notice-and-takedown system for online copyright infringement, there is an annex to the agreement stating that if a member state meets certain legislative requirements, it will be sufficient to comply. Canada’s current notice-and-notice system, which only requires ISPs to notify their customers of an infringement allegation by a copyright owner, has been considered sufficient. Under the USMCA, each party is required to implement civil and criminal remedies for parties that willfully circumvent Technological Protection Measures (“TPMs”) (e.g., digital locks) and Rights Management Information (“RMIs”) (e.g., digital watermarks) for the purpose of commercial advantage or financial gain. Canada already has legislation in place under the 2012 Copyright Modernization Act, and it is currently unclear whether Canada will be required to implement any additional remedies. The USMCA mandates that each party must ratify or accede to the Madrid Protocol, the Budapest Treaty on the International Recognition of the Deposit of Microorganisms for the Purposes of Patent Procedure, the Singapore Treaty on the Law of Trademarks, International Convention for the Protection of New Varieties of Plants (“UPOV 1991”), the Hague Agreement Concerning the International Registration of Industrial Designs, and the Brussels Convention Relating to the Distribution of Programme-Carrying Signals Transmitted by Satellite. Canada still must accede to the Madrid Protocol, the Singapore Treaty, and the Brussels Convention. Mexico already provides that, in a civil action, the owner of infringed trademark rights is entitled to at least 40% of the retail price of each infringing product sold by the defendant. This is likely to satisfy the USMCA’s mandate for pre-established damages to deter future infringement and to compensate right holders. Mexico currently does not grant its customs officials the right to detain and/or destroy counterfeit goods. Rather, customs may only inspect and inform rights holders about the allegedly infringing or counterfeit products, and even this does not apply to products “in transit,” similar to the Canadian provisions. As such, the USMCA will require Mexico to significantly broaden measures that may be taken by officials at the border. Mexico will also likely need to adopt parameters for determining whether a GI is generic as well as procedures for opposing, denying, and cancelling such registrations. Mexico currently lacks a specific body of legislation designating a specific period for data protection of biologics, though in some instances, courts have granted five-year terms based on international treaties such as NAFTA and TRIPS. Like Canada, Mexico will have 5 years to implement the ten-year term. Mexico also lacks patent term adjustment, and it will have 4.5 years to implement this rule. The USMCA includes an obligation to provide patent applicants with “at least one opportunity to correct or modify the claims.” The Mexican Institute of Industrial Property (IMPI) currently does not provide applicants with such opportunity when it finds patentable an invention as originally claimed. Because Mexican law prevents changes once examination has finished and a notice of allowance has been issued, the USMCA’s adoption will require IMPI to allow for amendments and corrections. Where Mexico requires the submission of undisclosed test or other data concerning the safety of a new pharmaceutical product as a condition for granting marketing approval, the USMCA prohibits generic manufacturers from referencing such data for 5 years from the date marketing approval was first granted. Mexico has 5 years to implement this change. With regard to undisclosed testing, the definition of ‘agricultural products’ has been amended to clarify that protection is available not only for chemical products, but also agricultural products that contain a chemical entity not previously approved in the territory for use in an agricultural chemical product. In addition, the protection period for such products has been extended to 10 years. Mexico has 5 years to implement this change. Mexico does not currently have a notice-and-takedown system for copyright safe harbors for Internet Service Providers (ISPs) and will have to implement such a system. Mexico has 5 years to provide civil remedies for the theft of trade secrets, prohibitions on impeding licensing of trade secrets, protections for trade secrets during the litigation process, and penalties for government officials who wrongfully disclose trade secrets. Mexico must accede to UPOV 1991, the Singapore Treaty, and the Hague Agreement. Increasing the data protection term for biologic drugs.